1) (Kenny Moore) – Harvard’s first bird of color, claims to be 1/32 raven. (yetanotherjohn) – Disgusted with the press, Mattis came out and shot the bird. NY TIMES Headline : Trump practices law without a license. (fustian24) – Brian Ross reported that the White House considered murdering this eagle. 4) (Wild_Willie) – “Stuff this”. 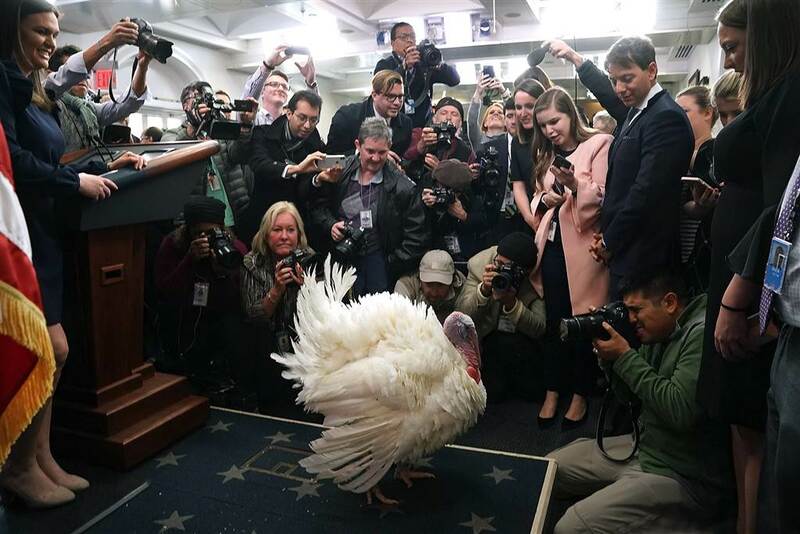 5) (Brian Brandt) – White House press corps demands that Sarah Huckabee Sanders produce pictures of herself giving birth to this turkey. 6) (Scorpion) – Having heard seeing his shadow would mean that Trump will be re-elected, the media exits their clown car to block the sun. (RadiCalMan) – You may have been pardoned for Thanksgiving, but it doesn’t extend to Christmas! (Joe_Miller – Come on people. This is Washington. You act like you’ve never seen a turkey before. (Par4Course) – A Republican holdout on Tax Reform holds a press conference. (rodney dill) – Why did Trump pardon the turkey, but not Hillary? Because there’s no chance ever, of Hillary being eaten. That’s all for this weekend. A new edition of the Wizbang Weekend Caption Contest™ will debut Friday morning.